The Christmas season is upon Marcy and her friends and she’s busy at the Seven-Year Stitch helping customers get ready for the holidays, but not so much that she can’t take some time off to help her friend Captain Moe by being an elf to his Santa Claus for sick children at the hospital. With Angus along for the adventure, Marcy arrives at the hospital to find that Captain Moe isn’t all too happy with the hospital administrator who is later found murdered–and Captain Moe is the now the suspect. All Morgan wants is a lovely Christmas holiday with her niece, and what she gets is a teenager more enamored with her electronic devices than creating special holiday memories with the aunt who loves her. Morgan believes the perfect solution is a holiday vacation in a rural spot with limited internet connection. What she gets instead is a sullen teen–and could it be possible a love of her life? Carter is a single father who’s used to it being him and his son and is happy with his life but wouldn’t mind a someone special to add into his family. Out on his park ranger rounds, he meets Morgan and can’t deny the instant spark between them. But can two people really fall in love in a short amount of time? And were their differences too much for a solid relationship ever to be built on? Nurturing that Spark had a Christmas setting and theme in the book. Morgan wants a connection with her family, holiday memories and love that they can build on, and she runs into problem after problem trying to get her niece on board. The harder she tries, the more the teen rejects her ideas and plans. I felt bad for Morgan because she wanted so much to create the perfect holidays and her niece didn’t seem interested. I liked seeing the interaction between Morgan, her niece, Carter and his young son and how they created a family holiday from two small families who both had felt they were missing something. I loved that Morgan’s spirits picked up as she started finding hope in having the type of Christmas experience she wished for. There is some family angst, but nothing too dramatic that takes away from the holiday-feel-goodness that I cherish in holiday stories. Trouble the cat and Billie Dean, the human he’s staying with, are having a rather mundane Christmas Eve until the man Billie Dean loves and who went was deployed overseas is now back in town. But something isn’t quite right about the business dealings going on in Billie Dean’s father’s dealership and Trouble is determined to find out the truth. This short story has a holiday setting, a mystery, and a sweet romance wrapped up into it. Trouble is definitely the star and I loved his voice. It had just enough angst in it to feel the characters concerns and worries without it taking over the holiday feels of the story. It’s the perfect length when you’d love to read a complete story but don’t have much time for reading. The holidays aren’t quite that merry for some of the women in Icicle Falls: Cass’s daughter is engaged and wants to get married this Christmas and have her father (Cass’s ex) and his new wife stay at Cass’s house, Charlene’s ex-husband waltzes back into her life with apologies and a renewed love for her, and Ella is trying to get used to being divorced which is hard when you still live with your ex. But, all is not what it seems and it will take the spirit of the holiday to help the women sort out truth from fiction. I love how this story shows the struggles of three women trying to find the Christmas spirit when it would be easier just to let it remain lost. This book has a nice balance of holiday setting, holiday theme, and the angst that can make us want to give up trying to maintain holiday cheer for those that we love (and who sometimes create our trying moments). Billy and Erin met while they were both in Hawaii on vacation. Erin was sure their time together was only a vacation fling and not true love so she slipped out of Billy’s room–and life–only to find she needed to venture back into his life since they created one together. This story takes place over many months, ending during the Christmas season. This was one of my favorite books as the characters felt real and had a great chemistry together, even when they were at odds with other. The issues they were trying to overcome came across as natural rather than obstacles created so the couple could struggle with being together. The ending was beautiful and poignant, a perfect Christmas story ending. (Currently, it’s one of my favorites.) I don’t normally add disclaimers but I wanted to let readers know this book does have some heartbreaking scenes of a very ill baby which might be hard for some readers, especially during the holiday season. And last is another holiday movie review, Mistletoe Inn (A Hallmark Countdown to Christmas Movie)- This movie is based on the book The Mistletoe Inn by Richard Paul Evans. Kimberly finds herself single just in time for the holidays when her boyfriend dumps her because she isn’t serious (like him!) about her writing. Kimberly has dreamed of being a writer but seems to allow her insecurities to hold her back from her dream. She finally decides to prove her ex wrong by going to a writing retreat that takes place in the Mistletoe Inn around Christmas time. I love a good romance, especially a Christmas one, and this one also throws in writing. I understood Kimberly as I struggle with some of her insecurities and being desperate for others approval. The holiday setting was perfect. I loved her love for Christmas (another thing I had in common with the heroine) and also how the famous (but never before seen in public) romance writer compared writing to decorating a Christmas tree. I hadn’t thought I’d come away with some good writing advice from the movie! This was a heartfelt Christmas movie and I thought the characters had a wonderful chemistry together. It was just what I love in a Christmas movie: small-time angst, getting to know and trust yourself and others, and love being realized and born during the holiday season. Twelve Days of Christmas by Debbie Macomber. The heroine in this story, Julia, loves the holiday season, actually she loves being cheerful and bubbly all year round. It’s who she is and can’t imagine anyone wanting to go through life in a sour mood and not acknowledging people–like her neighbor Cain. When he takes her newspaper by mistake (or maybe even deliberately) it’s not the action that pushes Julia over the edge but his lack of remorse and refusal to apologize. She vents to her best-friend and is given the idea of killing Cain with kindness. Since Julia needs an idea to blog about for the end of the year, she agrees. It doesn’t seem to work at first, but over time Julia finds the kindness magic working on Cain–and surprisingly on herself. This was a heartwarming holiday story that fits nicely into the spirit of the Christmas season. At times, I found Julia a little over-the-top in her actions, but as I got to know her more, I understood what was driving her. It was the perfect, sweet Christmas romance to get my seasonal reading off to a happy start. A Wish for Christmas (A Hallmark Channel Countdown to Christmas Movie)- Sara is the type of friend and co-worker everyone that I know would love to have: conscientious, friendly, helpful and agreeable…but sometimes too helpful and agreeable to where she is taken advantage of. After an idea of hers is stolen by her boss, Sara makes a wish that she was braver. How I understand that! There are many times in my life that I wish I could’ve stood up for myself more or been honest when asked directly about how I felt about something, or if I could do something for someone, I’d say yes because I didn’t want to disappoint or upset the other person even though it meant giving up something I wanted to do. Well, with the help of Santa, Sara is finally able to speak her mind. What I loved most about this movie, (there are two things but one involves Sara) is that even though Sara is tougher she never loses her niceness. She is able to stand up for herself without being rude or mean about it. I have read/seen other books/movies with this theme and the heroine usually has a huge chip on her shoulder and what she says and does is quite mean. 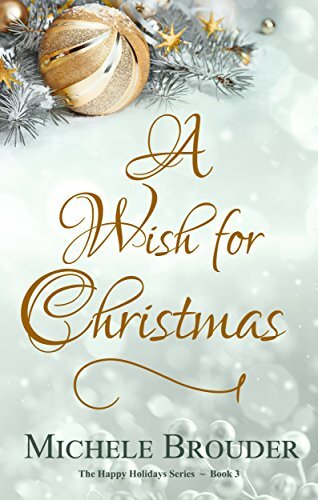 Not in a Wish for Christmas Wish, the spirit of the holidays (kindness, love, thinking of others) is still there while Sara learns she can be both strong and kind. The other thing I loved about this movie was Molly. When Sara tells her best friend how she’s been taken advantage of her, instead of Molly throwing a fit and ending the friendship, she realizes Sara is right and apologizes and changes her behavior. This is one of new favorite Christmas movies of this season (so far). I don’t know if it’s because of the “realness” of the characters or the message that strong doesn’t equal mean or selfish and you can look out for yourself while still caring and doing for others. The last review for this edition is Double Deck the Halls by Gretchen Archer. First, I must say isn’t that about the cutest holiday cover you’ve ever seen? I know I love it and wish there was an ornament for it…but I digress. This is a short crime caper story in the Davis Way universe but features Granny Dee as the point of view character. The story is set around Christmas Time where Granny is visiting her granddaughter and two great-granddaughters for the holidays…and to play in a slot tournament. I don’t want to give away too much lets just say that a Christmas personality that one usually trusts is up to some horrible shenanigans and Granny Dee must save the day. It was an enjoyable story, cute, not too much angst (how I love my holiday reading) and the perfect “size” to get in some needed holiday themed reading if you only have a short amount of time (like waiting in long lines, baking cookies, etc.). Stay tuned for more holiday reviews of books…and a few movies. I’m always eager to add to my holiday book and movie collection so please share! Happy Almost Holidays!